For the longest time I tried to eat here, but I was so busy with my travel schedule in and out of Bangkok, that I didn’t make it. Finally, when I was filming food videos for 2 straight weeks in Bangkok, one day for breakfast I had a chance to check it out and try a couple dishes. The food, in particular a hard to find dish called khanom jeen sao nam (ขนมจีนซาวน้ำ), was excellent. However, as I’m writing this post, I just checked their Facebook page, and as of the beginning of 2016, they’ve moved locations since I’ve eaten here last (see bottom of this blog post for more details, it’s just down the road from the old location). 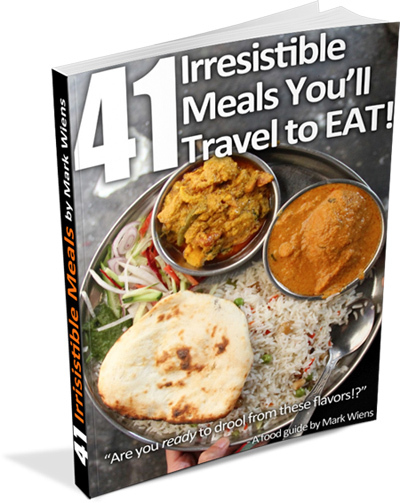 Location has changed, but you can still try these fantastic dishes. For my first dish, and one of the dishes that Somsong Pochana (ร้านสมทรงโภชนา) is most well known for, I ordered a bowl of kuay teow Sukhothai (ก๋วยเตี๋ยวสุโขทัย). 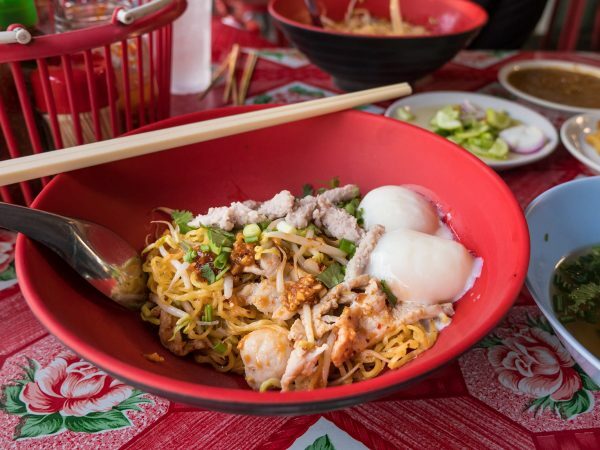 This Thai noodle soup, which originates from Sukhothai, is not really a very rare dish to find in Bangkok, but it’s definitely not widely available on every street corner like Thai chicken noodles or tom yum noodles. I got sen mee, the thin angel hair Thai rice noodles, and it came with the typical slices of pork, minced pork, and long beans. What’s interesting about Somsong Pochana (ร้านสมทรงโภชนา), is that they pretty much add the seasoning, like chili flakes and vinegar in your bowl for you before it’s served. The soup was sour and sweet, nutty, and with a spicy tinge following behind. 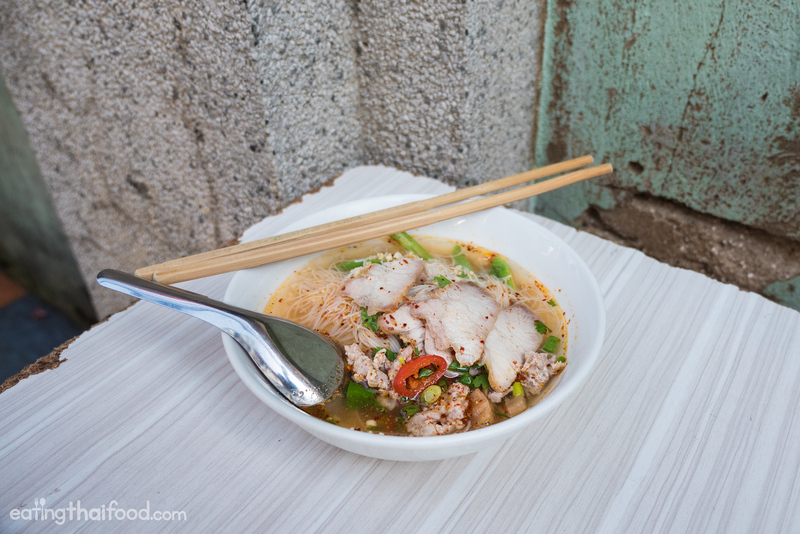 The mix of ingredients tasted fresh and the broth had a similar tom yum soup flavor to it. Overall, my bowl of kuay teow Sukhothai (ก๋วยเตี๋ยวสุโขทัย) was very good, a little on the sweet side for me, but still really delicious. My wife Ying ordered a bowl of kuay teow tom yum Sukhothai haeng (ก๋วยเตี๋ยวต้มยำสุโขทัยแห้ง), Sukhothai noodles with tom yum flavor, and the dry version, without soup. 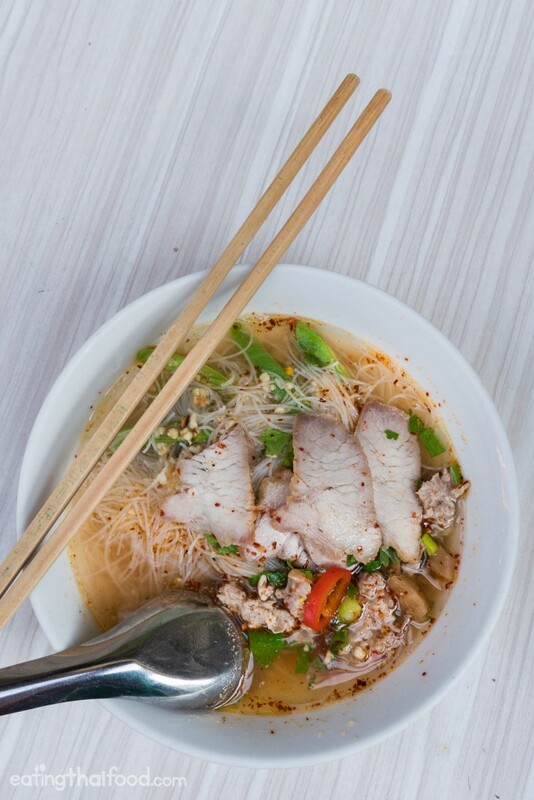 She also got sen lek, which are medium the Thai medium sized noodles. Again, the noodles were pre-seasoned before being served, with a little bit of chili flakes, ground peanuts, some vinegar and sugar to sweeten it up. 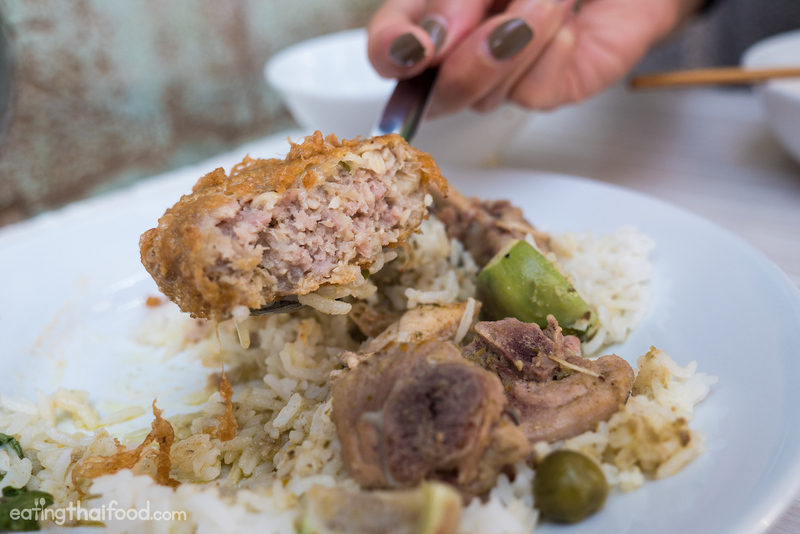 And again, what I did like though were the good ingredients, the sprigs of green cilantro, the crispy fish skin, the bean sprouts and the nuggets of minced pork. However, for me the noodles were too sweet for my taste, and the portion size was pretty small as well. 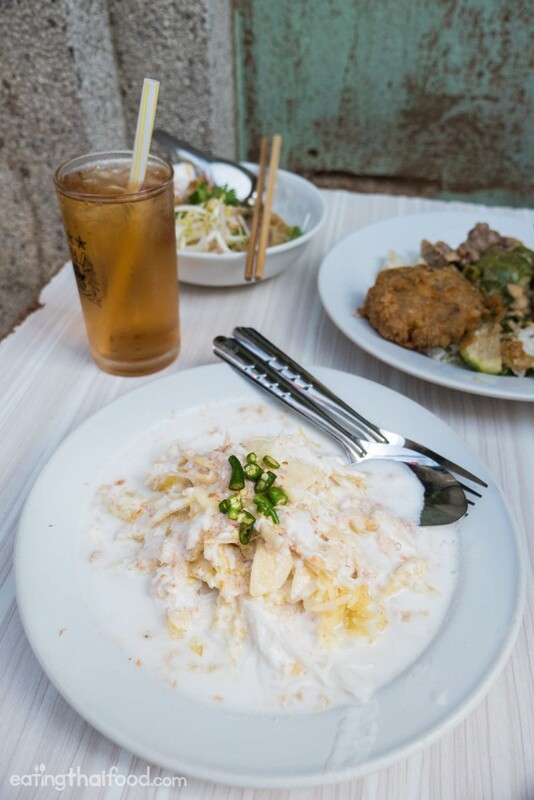 The dish I enjoyed by far the most at Somsong Pochana (ร้านสมทรงโภชนา), and the dish that’s quite hard to find, especially at a local restaurants (rather than a high end restaurant or a market for takeaway) in Bangkok was khanom jeen sao nam (ขนมจีนซาวน้ำ). 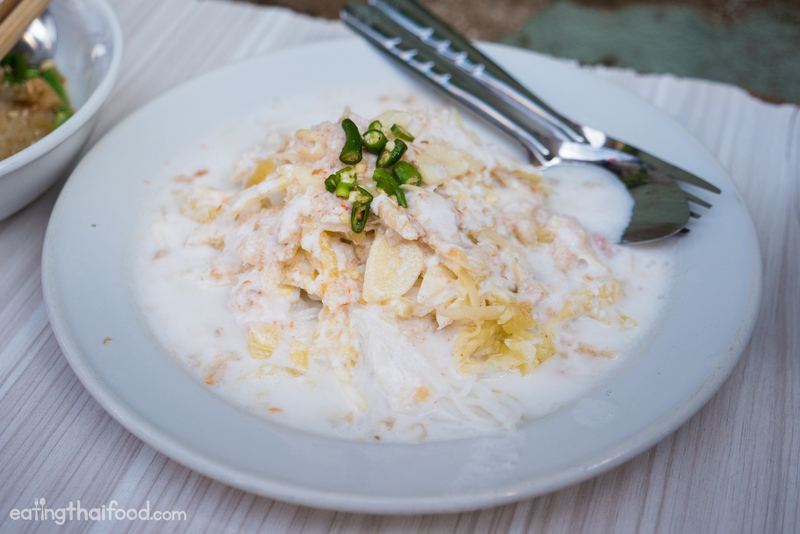 Khanom jeen sao nam (ขนมจีนซาวน้ำ) is a Thai dish that includes the white, lightly fermented khanom jeen rice noodles, topped with coconut cream, dried salty shrimp, pineapple, ginger, and garlic. 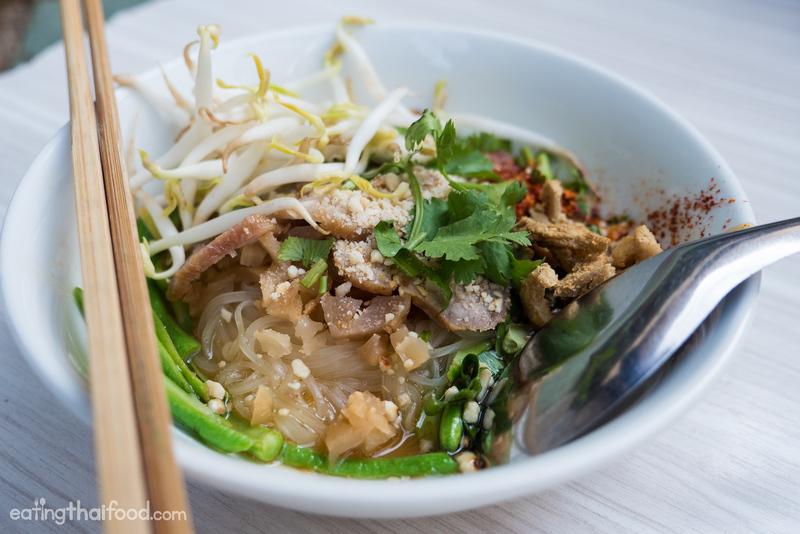 There are many different curries that are commonly eaten with khanom jeen, but sao nam is a rare version. 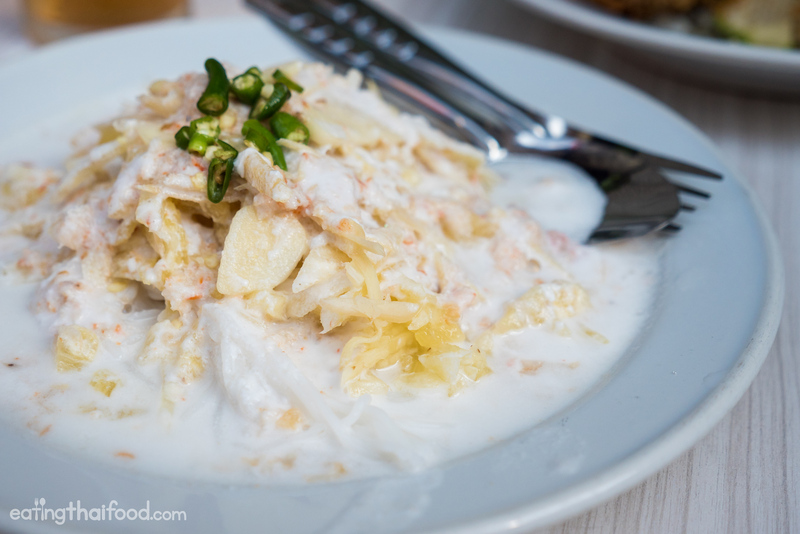 I’ve had khanom jeen sao nam (ขนมจีนซาวน้ำ) from a market in Bangkok before, and I didn’t care for it because it was overly sweet, but the traditional recipe for the dish should only be sweet from the natural coconut milk and the pineapple. The version at Somsong Pochana (ร้านสมทรงโภชนา) was fantastic. The coconut sauce was sweet from the mature coconut milk, properly buttery and thick, and the sweetness was countered, and the coconut taste was strengthened, by being slightly salty. The very thin julienned slices of pineapple added a sour acidity to contrast the buttery coconut milk, and finally the thin raw slices of garlic and young ginger added the finishing touch of flavor and freshness. Khanom jeen sao nam (ขนมจีนซาวน้ำ) is such a simple combination of ingredients and flavors, but when it’s done right, like they do it at Somsong Pochana (ร้านสมทรงโภชนา), it’s so unbelievably refreshing and good. 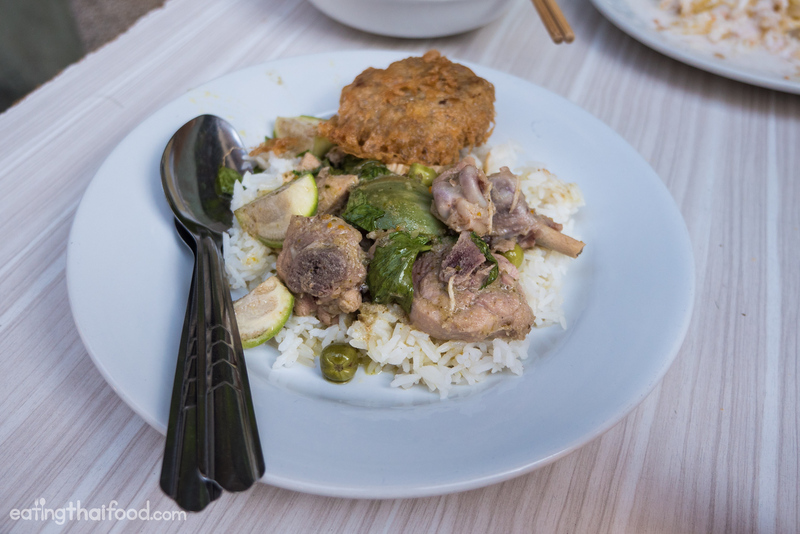 Additionally Somsong Pochana (ร้านสมทรงโภชนา) offers a variety of different curies in the morning, and you can take a look to see what they have on the day you go – a supplemental plate of rice and curry is rarely a bad idea. I couldn’t resist. 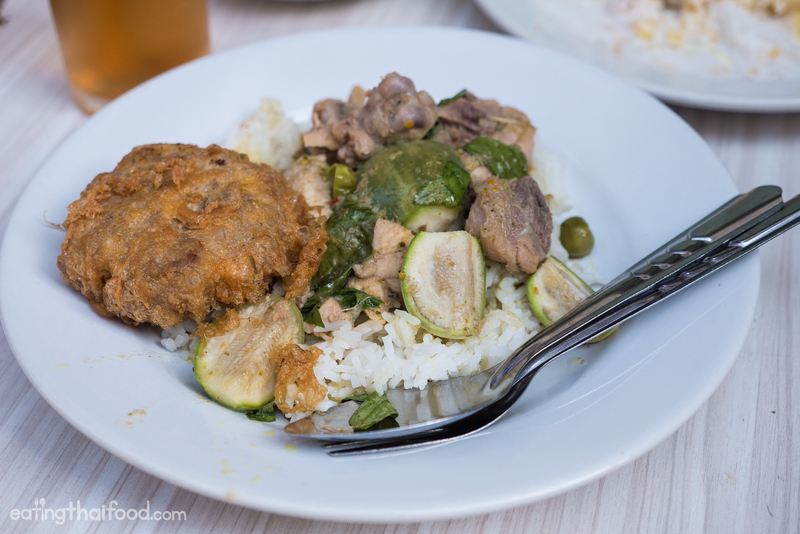 For my two main dishes on top of a plate of rice, my wife and I got gaeng keow wan gai (แกงเขียวหวานไก่) and moo tod (หมูทอด), green chicken curry and a deep fried pork patty. The taste of the green curry was pretty good, you could really taste the green chilies, and there was lots of sweet basil, wilted into the curry to give it an oomph of fresh basil flavor. The deep fried pork patty was also wonderful, a hamburger sized patty of minced pork mixed with lots of garlic, dipped in what I think was a straight egg batter, and deep fried until golden brown. It was seriously tasty. 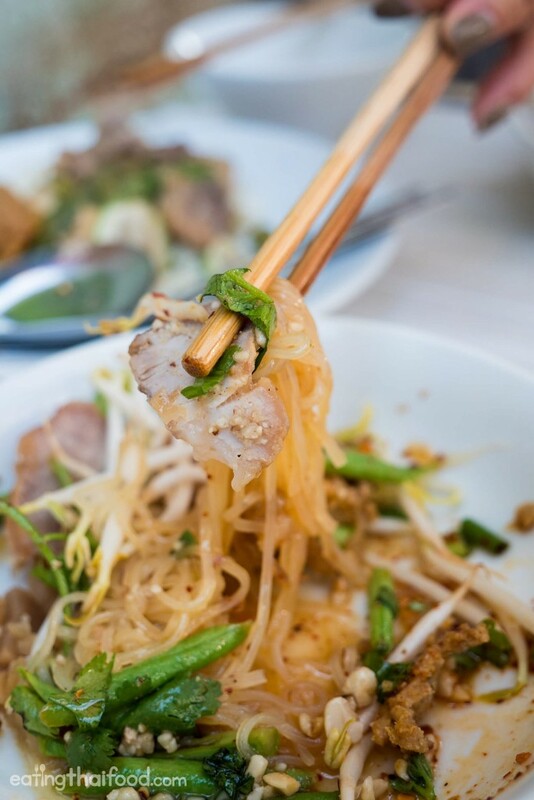 Somsong Pochana (ร้านสมทรงโภชนา) is a long standing classic restaurant in Bangkok, known especially for serving Sukhothai style noodles, and a dish of fermented rice noodles and coconut milk called khanom jeen sao nam (ขนมจีนซาวน้ำ). 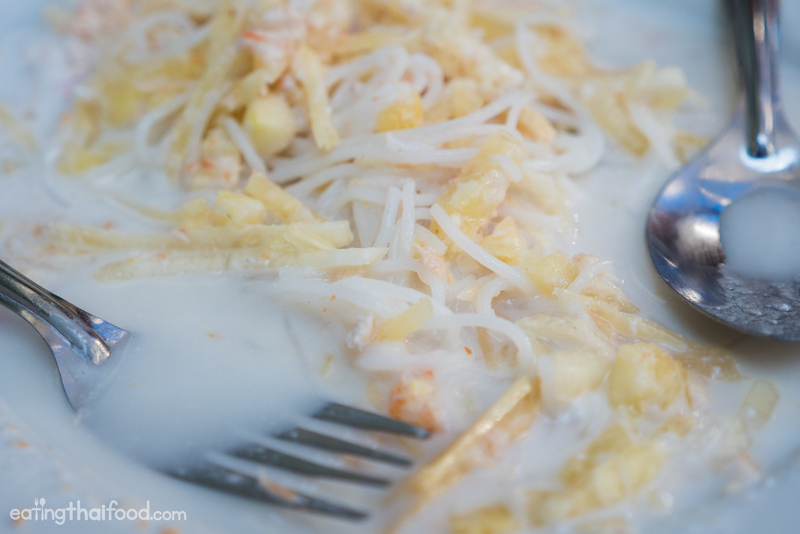 The khanom jeen sao nam (ขนมจีนซาวน้ำ) in particular, with its contrast of rich coconut milk, pineapple, and ginger, was an incredible dish here. Since I took these photos, the restaurant has moved locations, about a 5 minute walk from their original location. I haven’t been to the new location yet, but I was just browsing their Facebook page and saw some photos. It looks like it’s been upgraded from its really family home style feel, and there’s even an AC now. Although some of the old style Bangkok charm may have been lost, I’m pretty sure the food and taste will remain the same. 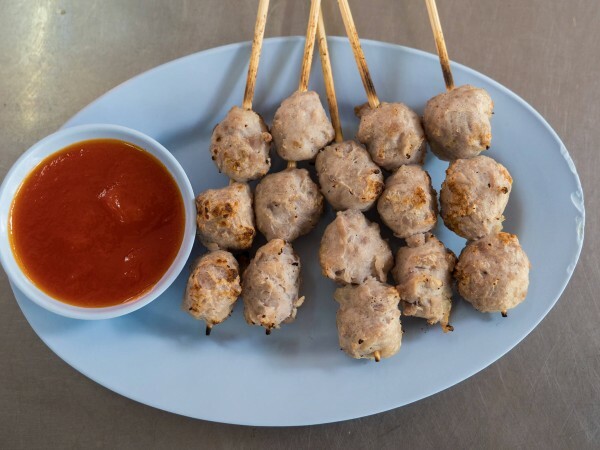 Prices: Typical street food prices, you’ll pay around 35 – 45 THB per dish. This time eating here I failed to remember how much we paid, but I think it was under 150 THB for everything we ordered. 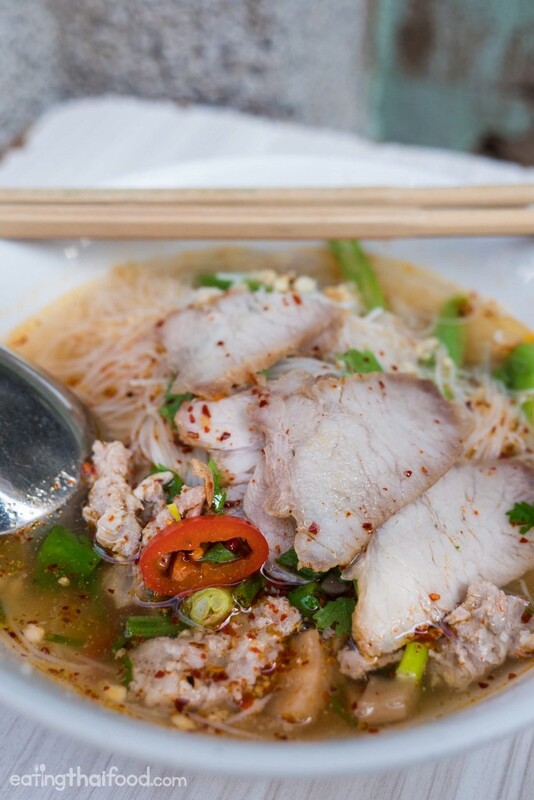 How to get there: Somsong Pochana (ร้านสมทรงโภชนา) is now located right along Samsen Road, in between Soi 3 and Soi 5. If you’re in the Banglamphu area or at Khao San you can walk there in about 5 minutes. 3 comments. I'd love to hear from you! Been a fan of yours for years. Your youtube videos encouraged me to come toThailand, and I’ve fallen in love with the country and the cuisine. 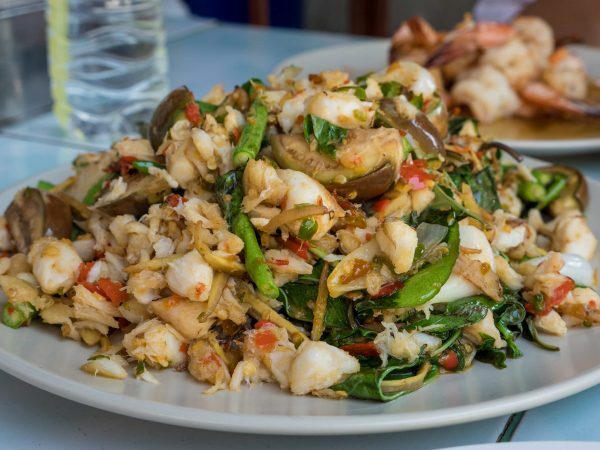 In my spare time, I like to write about less well-known Thai dishes for visitors to Thailand. Hey Ronan, great to hear from you, nice article. Are you based in Thailand now? Thanks for the quick reply Mark. Yes, I ‘m living in Chiang Mai at the moment. I love it here. It’s tough to get into food writing though, as I’m sure you’re well aware of. So I kind of do it out of passion in my spare time.